McCrae did not survive the war. He died of pneumonia and meningitis, while still in service, nearly 3 years after writing his famous poem. 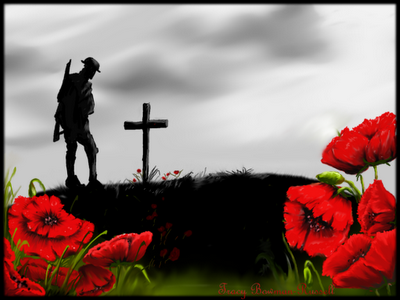 Will you wear your Poppy for the next few days? A death in the family takes me away from writing this week. Herewith, I post an article I wrote in my role as Surgeon General of the Naval Order of the United States. It should appear in the Order’s spring newsletter, publish date to be determined. The US Navy was a relative latecomer to the establishment of a permanent corps of physicians to serve the health of sailors. While the navy assigned medical officers – doctors commissioned in the naval service – to ships and shore establishments from the very beginning, surgeons (the other term commonly used for navy physicians) did not have their own organization in the Navy until the establishment of the Medical Corps on 3 March 1871. Historically, in the west at least, mention of physicians serving aboard naval vessels goes back to the Greek poet Homer. The Roman navy is believed to have paid its surgeons double the army rate in order to encourage their service in the less prestigious military arm. During the late middle ages, the Italian maritime republics routinely posted surgeons aboard ships, and during the Crusades, naval surgeons established shore based facilities for the care of injured and sick sailors. Medical Officers of Genoa and Venice were responsible for issuing health certificates to sailors of these navies; these officers also established port quarantine (from Italian quarantina giorni–”forty days”) procedures for prevention of imported contagion, especially the plague. In the modern era, the Spanish and French were early to adopt standing naval medical establishments, maintaining naval hospitals in colonial territories. While the British Royal Navy had surgeons aboard ships from the 15th century, they did not form what might be recognized as a formal medical corps until 1805, when for the first time, surgeons of the Royal Navy were granted rank similar to other military officers, and a distinguishing uniform. From the beginning, U S navy regulations specified a unique uniform for medical officers, but they were not granted rank-equivalence with their line officers until around the time of World War I. Prior to that, medical ranks were Assistant Surgeon, Passed Assistant Surgeon, Surgeon, Medical Inspector and Medical Director. At the time of Medical Corps formation, the prescribed uniform feature that designated a medical officer was a strip of cobalt color between the rank-identifying gold sleeve bands: (here the rank of Medical Inspector, equivalent to Commander). Today the unique designator for a U S Navy doctor is the acorn-on-an-oak-leaf – – a symbol of obscure origin instituted by Naval Regulations in 1897. Vallejo was the home of what was then the largest west coast Navy Yard at Mare Island, just across the quarter-mile wide Napa River from the city. With a pre-war population of around 20,000, a huge influx of war-effort laborers (2) and their families had seen the city grow to 76,000 according to post office estimates (Director of the Office of Civil Defense to Navy Surgeon General June 20, 1942). The City Council estimated an “area census of 80,000 persons” (Telegram from City Council to Honorable Sheridan Downey, U S Senate, dtd May 25 1942). Meanwhile, the only hospital serving the city was a private facility of 68 beds, one small operating room, one delivery room, an “antiquated” x-ray facility and “meager” laboratory (Director of Civil Defense, cited above). Added to this the 36 bed hospital in nearby Napa, 60 beds in the County Hospital in 18-mile distant Fairfield and a smattering of beds in tiny private hospitals in surrounding cities, this allowed for one bed per 430 residents. The area acceptable “minimum”, based on the city of San Francisco, was one bed for 250 persons. (See (2), below.) The need for more beds was clearly urgent. The government had quickly constructed public housing for yard workers, but this housing was exempt from local tax. And because the County supervisors of Solano County – of which Vallejo lay at the western-most edge – were “engaged in agricultural occupations, [they were] not inclined to make adequate provision for the industrial area” of Vallejo. (Director of Civil Defense, cited above). Short on revenue but great with need, early in 1942 – my information doesn’t give me the date – the City applied to the Federal Works Agency for construction of a 250 bed hospital, under the 1940 Lanham Act. Despite the urgency of the need, inevitable bureaucratic delays ensued. 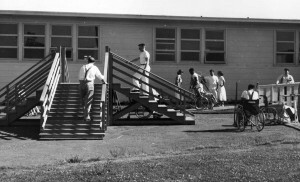 Prompted by California Senator Sheridan Downey (Downey to McIntire May 29, 1942), the Surgeon General weighed in on the matter with a memorandum to the Chairman of the Red Cross suggesting that a 50 to 75-bed temporary hospital built by the Red Cross “to relieve the acute shortage, until such time as the F.W.A. [Federal Works Agency] provides the authorized beds.” He added, “Should the Red Cross do this I am sure it would have a stimulating effect on the F.W.A., and I believe it would create a favorable impression throughout the county…” (McIntire to Chairman Norman H. Davis, American Red Cross, November 26, 1942). In January 1943, almost a year into the process, McIntire apparently phoned Major General Phillip B. Fleming, the F.W.A. Administrator, to push a bit, because Fleming wrote in reply on January 14 that he had “investigated progress and [found] the excavation [was] now under way, the architect’s plans are finished, the material list for submission to the War Production Board will be in this week and the contract should be let for the superstructure by the end of next week.” A memo from Red Cross Director of Medical and Health Services – Pacific Area, highlights the bureaucratic tangle slowing progress of the project: “The Vallejo Hospital Project has reached the last in a long series of approvals required for a Lanham Act grant. The Regional Office of the U. S. Public health Service had to recognize the community need for the hospital, and approve, from a medical point of view, the original plans for its construction. The application for the Lanham Act grant and the plans were then sent for approval to the Public Buildings Administration, and the office of the Federal Works Agency. Pressure from the Red Cross and the navy brought the project to the attention of General Fleming who saw that it was rushed through the necessary channels and sent on to the War Production board.” (Milton Rose, MD, to M. E. Lapham, M. D., Executive Officer, Procurement and Assignment Service, January 27, 1943). Finally, General Fleming could write McIntire to indicate that construction was expected to be under way by 1 April 1943 (Fleming to McIntire, March 10, 1943). The records at hand are silent on when the hospital, subsequently called “Vallejo Community Hospital”, opened for business. Gait Training at Kaiser Rehabilitation Center Vallejo California. In background is a World War II cantonment-style hospital building. Kaiser-Permanente continued use of the cantonment style pavilions as clinic buildings until the mid 1980s when a modern two-story clinic building opened. 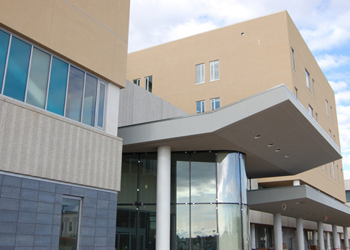 In 2010, the organization replaced a 1960s-era hospital tower with a modern, state-of-the-art “green” hospital. Downey’s(1) Navy Bureau of Medicine and Surgery correspondence on this matter is located at National Archives II in College Park MD, Record Group 52, Entry 15B, Box 105, File NH22/EG-2 to NH22/EG19. I cite dates of individual items in this file in this article. (2) The Navy Yard workforce had increased from a pre-war 6,512 to 34,704 according to a letter from the Mare Island hospital commander to the Navy Surgeon General, dated June 1, 1942. The hospital CO stated a city population estimate of 75,000. (3) Smillie, MD, John G., Can Physicians Manage the Quality and Costs of Health Care? The Story of the Permanente Medical Group, The Permanente Federation, LLC, 2000. In previous postings, I commented on troubles at the NHHC that a Navy Inspector General inspection report brought to the attention of high Naval authorities last December. So damaging was the report that it seemed the Director’s resignation would be inevitable. And inevitable it was: RADM Jay DeLoach announced his voluntary resignation from the post late in April, to take effect 15 May. + an advisory panel of eminent naval historians – which had not met since DeLoach took command – had been permitted to expire, thus depriving the Director of seasoned, professional advice. But now this episode is coming to a close. The Navy has appointed an active duty Line navy captain interim director. What of the future of NHHC? It is entirely appropriate that the Director of Naval History be a flag rank Naval officer – probably preferably a line officer. This person will more easily have the ear of high naval and DoD authorities in his or her role as advocate for Naval history. He or she will also be more likely to listen to “operational” navy needs and uses for historical information. It will be absolutely essential that the new Director name professional historians or archivists as his deputies. I can envision historical, archival and museum assistants at the very least. These people can, if properly vetted, be effective liaisons between the Director and the “operational” civilian staffers who do the daily work. It’s critically important that the Blue Ribbon Panel of eminent historians – the majority of whom probably should be naval or military historians – be re-established and tasked with assuring that the Director gets regular (annual for certain) and authoritative advice on how best to run his or her extensive and very complicated organization. The “needs assessment” has been pretty much done: just read the IG’s report. Now it’s time for the new Director, with stout backing from all the way up the chain of command, to roll up sleeves and get to work preserving, protecting, producing and promulgating the Navy’s glorious history. Inasmuch as past is prologue, our future depends on it.